Home » Blog » Does Every Local Citation Need to be Cleaned Up? Clean local citations are an essential part of local SEO. It’s one of our highest priorities for the clients we take on at Advice Local and a topic we emphasize to our partners. Any mention of a brand or business online, no matter the forum, has the power to make or break a consumer opportunity. If information is incorrect or misleading, trust is already violated; just like in personal relationships, it can be difficult to regain. But, let’s be real: combing through every single local citation is exhausting, especially if it’s on your own time. Due to the amount of time that it detracts from other areas, it seems only logical to ask the obvious question: when do businesses really need to clean up local citations? Are there instances when you can let one slide? If the citation doesn’t generate high traffic or is obscure and comparatively minor, it probably won’t sabotage too many opportunities. But, let’s go into detail about when it’s never acceptable to let an incorrect or duplicate listing remain as-is. The long and short point of every local SEO effort? We’re all vying for the same spot on the internet. In terms of local search, that spot is page one of search results from Google, Bing or another search engine. Because local citations can help earn the top spot in a search, businesses should run some tests. The first test: search for the local business or brand by name. What’s the first thing that pops up? If it’s an old citation with an outdated number or former address, know that’s the first thing a potential consumer sees. This information needs to be cleaned up. The next test involves a keyword-based search. 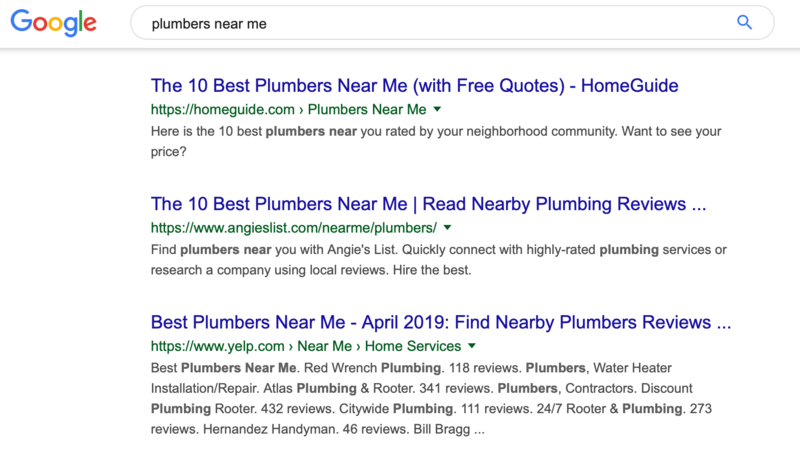 We ran a simple “near me” search that included the targeted keyword “plumbers”. This brought up, immediately below the local pack, the review sites HomeGuide.com, Yelp and Angie’s List. According to a BrightLocal survey 86 percent of people out there read online reviews before frequenting a local business, so a review site is typically one of the first places they’ll look. The quality of the citations there are important to look into. The last test, because it’s one of the easiest, is to run our free Online Visibility Report. This report will quickly show you which sites in our network a business is listed on and if the listing is correct, incomplete or missing. Is There Confusion About a Local Citation or NAP Inconsistency? If there is any vocalized confusion coming from a consumer about a listing, or a lost potential consumer, that’s a major sign that it needs to be cleaned up. This means the listing is misleading enough for people to speak about it on public forums. Whether it’s on a Google My Business listing for all to see or in the comments section of a website, Super-Empowered Consumers who aren’t satisfied will always be the first to speak up. NAP (name, address and phone number) inaccuracies are a serious thing to rectify. Any inconsistencies probably confused far more than the vocal minority, and these citations should be at the top of the list of those to clean. Is the Inaccurate Citation on a Government or Other High-Authority Sites? Citation inaccuracies on government websites are important to note for two main reasons: 1. They can be tricky to correct, but 2. they have to be addressed. These citations are heavily relied upon for data by location-based source like Google Maps and the four data aggregators used in the United States. Government sites are go-tos because of their authority. In the case of updating the data aggregators, it’s especially important to take care of the problem before that incorrect information is further disseminated across thousands of channels. This can create more unnecessary damage for a brand now, plus more work sorting through the mess later. High-authority sites with local citation inaccuracies should be the first ones checked and corrected. The previous points are all instances when you should not hesitate to correct any “bad data,” which we consider to be inaccurate citations and other incorrect forms of local SEO. Start the citation cleanup process by correcting high-authority sources, like the government sites and data aggregators we discussed above. 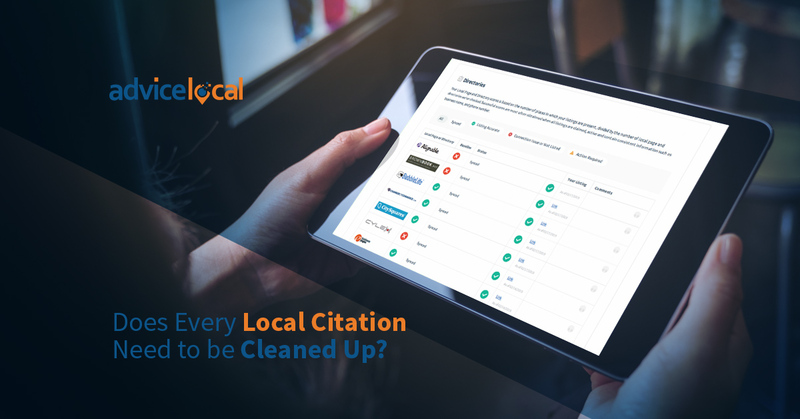 Here’s a infographic on citation cleanup and The Complete Guide How-to for Local Citation Audit and Cleanup that will walk you through the process step-by-step. Then, make a plan to build high-quality local citations going forward. At Advice Local, we offer superior, in-house local listing management services that our clients and partners trust. 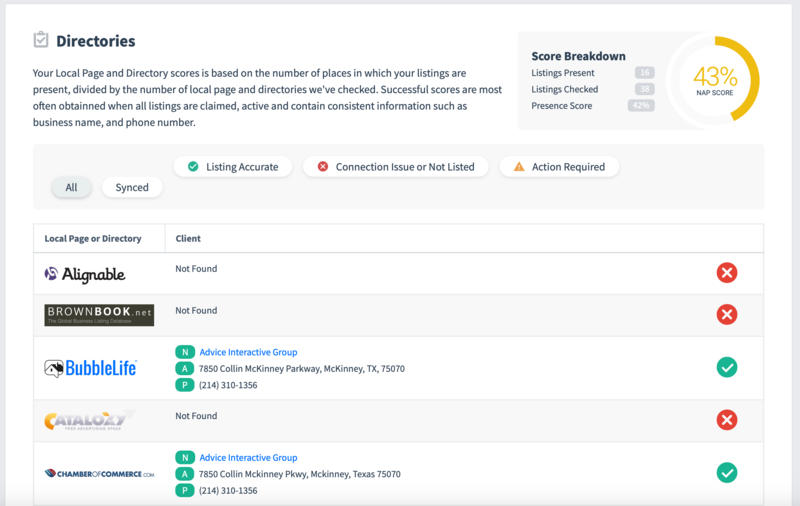 Part of local listing management includes real-time citation monitoring. Let us do the busywork to maintain your visibility, and allow yourself more time to hone and improve your brand. Request a demo today and see our local SEO software in action!